Fresh off my first two half-marathons (Naples on Jan. 20 and Fort Myers on March. 3), I was on my way to Rome for the papal conclave. Pope Benedict XVI had stunned the world on Feb. 11, announcing that he would step down officially on Feb. 28. After consulting with my wife and my boss (in that order), I was given the green light to go to Rome for the conclave. I blogged extensively from Rome (Report 1, Report 2, Report 3, Report 4) and did several radio and television interviews from the Vatican. On the plane from Atlanta to Rome, I met Deacon Bill Jacobs and his wife Toni from the Diocese of Knoxville. We got around to discussing the conclave and Bill mentioned that the Rome marathon — which would be taking place in six days — may have to alter its route around the Vatican because of the conclave and the high traffic comes with it. “Well,” says I, “that’s funny because only two weeks ago I ran a half marathon. I’ve always wanted to run a complete marathon.” George W. Bush had run a marathon, and so had Oprah Winfrey. And if Oprah could run 26.2 miles, then by heck so could I! 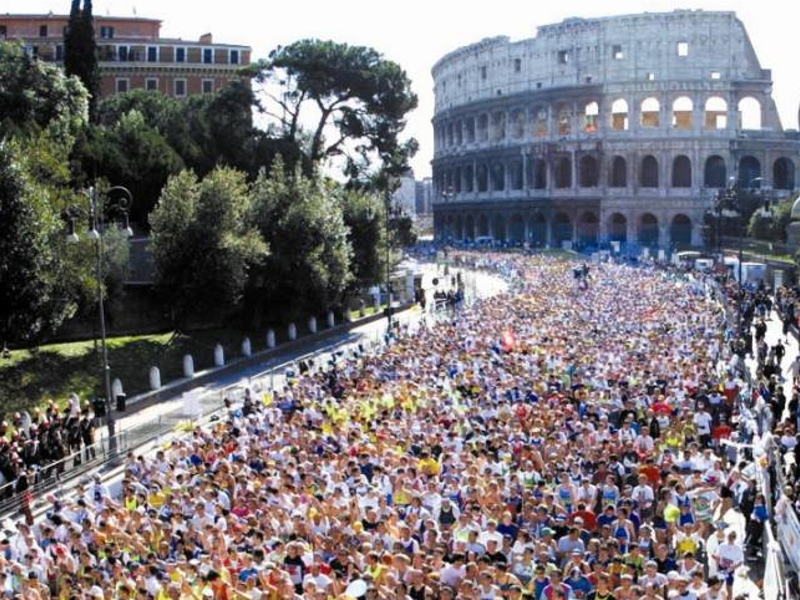 More than 14,000 runners competed in the 2013 Maratona di Roma. I had brought my running gear to Rome with the intention to run around the Vatican walls. The circumference of the entire city state is a mere 3.2 km (2 miles). It’s a short jog considering I was averaging more than 4 miles per run and I was staying a stone’s throw from the Vatican walls. However, the first few days in Rome were rainy and frigid, barely edging into the 50s Fahrenheit or double digits in Celsius. I had planned on waiting for a warmer day to run, but on my second day in Rome, I struck up a conversation with two young ladies from Ireland. They were in Rome not for the conclave, but for the marathon. “Hmmm,” I mused. “Since I am in shape, in Rome, with my running clothes… perhaps I should sign up!” Given that it was happening on St. Patrick’s Day, this was an easy decision. After all, my only plans for the day were to go to Mass and to take in Pope Francis‘ first Angelus. I prayed, consulted my marathon-running friends back home via Facebook, did a little research of my own, and decided to go for it. Since I wasn’t a member of an official running club, I had to get a letter from my doctor saying I was OK to run. A quick Skype call took care of that problem and her letter came e-mail and fax. On Friday afternoon, I took the metro to the Marathon Village in the Palazzo dei Congressi in the south end of Rome and plunked down my €80. I was in… but I didn’t know what I was in for other than pain and 42.195 km/26.2 miles. My next stop was a big pasta dinner with former Ann Arborite, Fr. Mark Thelen, LC. We were long-time Facebook friends and despite having lived in the same city for a short time, never met in person. Among our first topics of conversation … running. I told him I had just signed up for the marathon only to discover that he was also going to be among the 12,000 strong running on Sunday. The funny thing is that when I arrived at the Colosseum to start the race, he was among the first people I bumped into! I got a priestly blessing from one of his colleagues to boot! 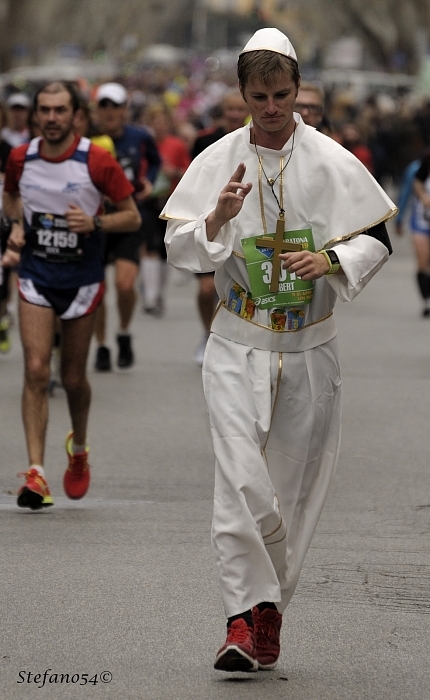 Even the “Pope” ran the marathon. I think he was an anti-Pope because an hour into the race I saw him relieve himself in a bush. The race began at 9 am, which is a late start. Most races start at 7 am. I was grateful for the extra few hours’ sleep because it took an hour to navigate the metro system. 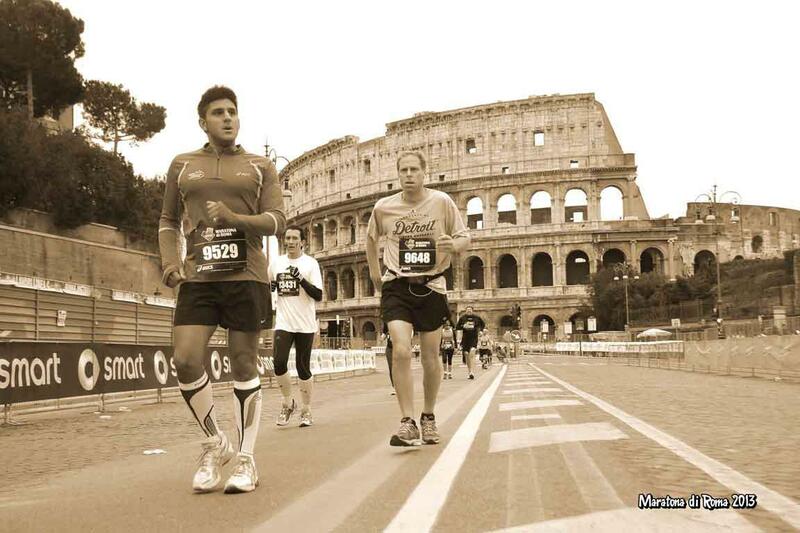 The Colosseum station was out of order, so I had to walk an extra 10 blocks to the Start line. Navigating the immense crowd wasn’t a problem, but the lines for the porta potties was. I waited 10 minutes for my turn. I heard the gun go off shortly after 9 am, but I was probably 10,000-deep in the crowd. I didn’t get to the Start line until about 9:06 am. Thankfully, the chip timing device embedded in the race number I wore tracked the “gun time” and the “real time,” which is the time from the Start line to the Finish line. My marathon-experienced friends advised me to “take it easy and not push myself for the first 20 miles or so.” Easy for them to say! My longest run prior to this had only been 13.1 miles! However, it was sound advice. The weather was a little chilly for Rome in March — about 44 Fahrenheit or 7 Celsius, but with my tunes in my ears and my Runkeeper app keeping me on pace, it felt good to be running in my favorite city in the world. I don’t remember the first song as I crossed the Start line, but I’ll never forget rounding the corner to pass the Colosseum with “Eye of the Tiger” in my ears! 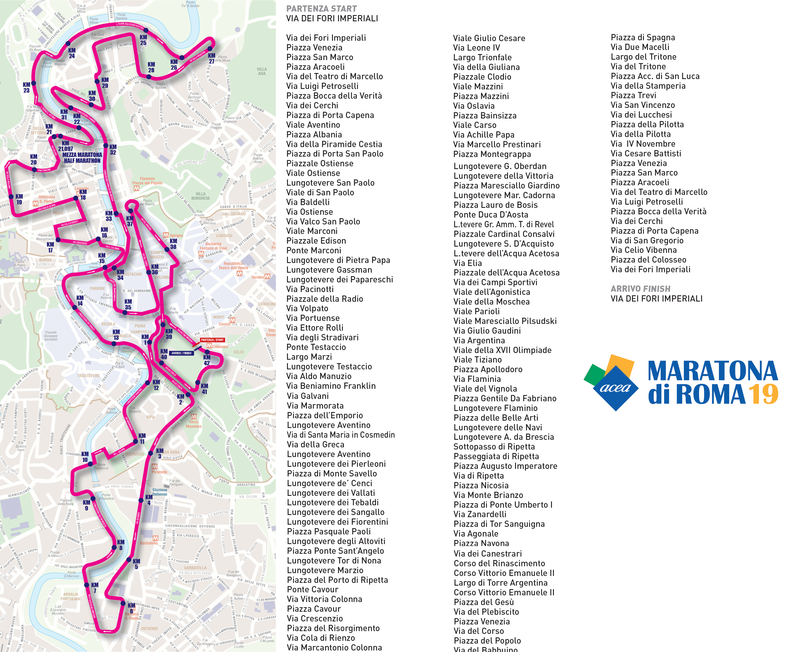 Marathon organizers ensured that most of Rome’s top sites were along the route (click here for a map of the entire route). Only 6 km from the Colosseum, the first landmark along the route was the Basilica of Saint Paul Outside The Walls where the mortal remains of the great evangelist reside. More important to runners, however, are the water/Gatorade stops. Historic sites and classic architecture are wonderful, but no one can run a marathon without hydration and food! One interesting aspect of this race was that every 5 km or so, they had a sponge station. Volunteers would had runners a water-soaked sponge to wipe off their sweat. Interesting concept. I resisted until near the end, but ended up enjoying it! It was fun running through some of the “sponge stops” and tromping over the hundreds of hand-sized sponges dropped by previous runners. My lone criticism of the well-organized event was that the toilets and hydration stations were a little too far apart. I ended up carrying a water bottle for about two-thirds of the race. OK. Truth be told I have a second criticism. Just as Deacon Bill had predicted, the race was rerouted away from the Vatican because of the conclave. Since it was the day of Pope Francis’ first Angelus, it was probably a good thing. My friends told me that St. Peter’s Square was absolutely packed that day. 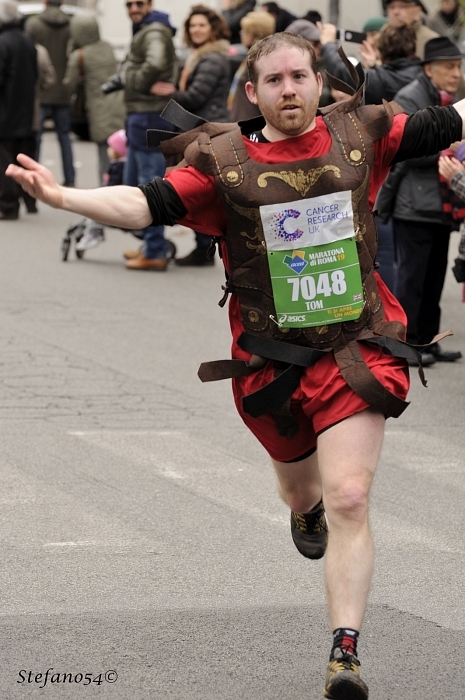 A Roman centurion (or reasonable facsimile) crosses the finish line during the 19th annual Rome marathon on March 17, 2013. The race continued from St. Paul Outside the Walls north along the Tiber, through Trastevere, past Castel Sant’Angelo, reaching the half-way point near Santa Maria della Vittoria, the minor basilica opened in 1620. My goal for the entire marathon was 5 hours, since I had run my best half marathon time of 2h 8m just two weeks earlier. When I realized my half-marathon time in Rome was 2h 38m, I knew 5 hours was out of the question. The route continued north and crossed the Tiber again to the Piazza delle Muse before turning south. When I was near the Castel Sant’Angelo, an American woman along the route noticed my Detroit Tigers’ t-shirt and shouted, “Go Detroit!” I met Canadians, Brits and several Americans during the race, many of them from the Allied Joint Force Command in Naples, 140 miles south of Rome. The route back to the Colosseum was far more interesting. They had saved the best sites for the last. However, I was not at my best. The first half of the race was a relative breeze, but 30 km (18 miles) in, I started cramping up a bit. I stopped every couple of miles to stretch. I was bound and determined to finish. I was not about to quit or worse, be carried away on a stretcher. The last 8 km of the route passed through the Piazza Navona, Piazza del Popolo, Spanish Steps, Piazza Trevi, and the famous Trevi Fountain before the final bit of torture called El Último Kilómetro — the final/ultimate kilometer — which is the final 1,000 meters uphill to the Finish line. Just after I passed the Trevi (around 39 km), I tripped on an upturned cobblestone. Thankfully, less than half of the race was over these ancient blocks of rock, which are far more difficult to run on than pavement. The stone that tripped me was not lying flat as it should, but was turned on its side and still in its hole. I didn’t see it, but my foot caught it as I passed. By God’s grace, I caught myself rather than crashing to the street. I’m not sure I would have been able to finish if I had fallen. Ever since the 18-km mark or so, the back of my right knee and the top of my left foot were giving me cause for pain. They still do. As the finish line drew near, every step was more difficult than the last. My muscles simply would not do what I wanted them to do. They felt like massive lead blocks as I alternated between a quick walk and a light jog. I probably only lifted my foot an inch off the pavement for each step, but I did it! My official/real time was 5h 30m 18s. Not bad for a first marathon when I hadn’t trained for it. At the finish line, a volunteer handed me my medal (a beautifully crafted souvenir) and another wrapped me in a shiny metallic emergency blanket. I was warm within seconds! Then I got in line for a short rub-down — essential to post-race survival for marathoners. From there, I staggered to the Metro. Last on my list for the day: Mass at St. Peter’s Basilica, a full massage, then my first full meal of the day! Now I know know what St. Paul meant when he said, “I have competed well; I have finished the race; I have kept the faith. From now on the crown of righteousness awaits me” (2 Tim 4:7-8). No crown for me, but the medal is nice! This year I added two new bumper stickers to my car. Despite the pain, I’d do it again in a heartbeat. In fact, I might just start shopping for flights to Rome already! PATRICK NOVECOSKY is the editor of this blog. 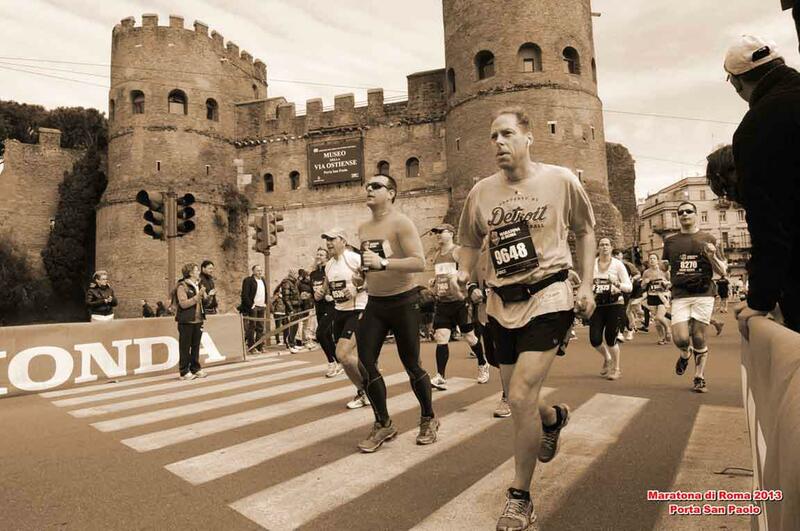 He ran his first full marathon in Rome on March 17, 2013. Officials report that 14,183 athletes entered the race (11,871 men, 2,312 women). Novecosky came in 10,123th place.